TLV CK series check valves are ideal for nearly all types of fluid processes with their high sealing performance in both vertical and horizontal piping and their rapid open-close mechanism. Select among 3 types of sealing surfaces, depending on the temperature and fluid requirements. Wafer-construction (flangeless) check valve body is sandwiched between pipe flanges. Center-guided disc and large flow area ensure superior durability and capacity. 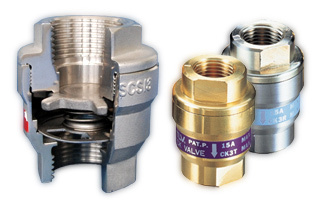 Select the check valve with features best suited for the application. Spring and disc construction provides tight closure. Simple installation in either vertical or horizontal pipelines. Lightweight disc valve for agile operation. Select between a metal valve seat or a soft valve seat for use with steam, water or air. Available in sizes up to 100 mm on some models. All stainless steel construction (CK3M/CK3T/CK3R also available in brass or bronze). Piping that requires backflow prevention. Locations where frequent opening and closing operation is expected. The spring and disc construction allows the valve to open at the slightest pressure differential, and the valve seat provides an extremely tight seal. The valve closes the instant backpressure exceeds line pressure. The center-guided disc eliminates the tilting effect that can cause sticking in large-sized disc-type check valves, thus ensuring operation and offering increased reliability. 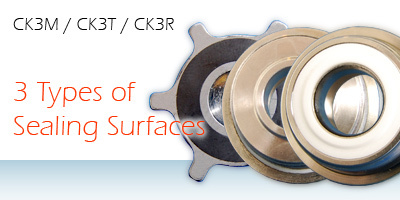 CK3M/CK3T/CK3R: Select among 3 types of sealing surfaces, depending on the temperature and fluid requirements. 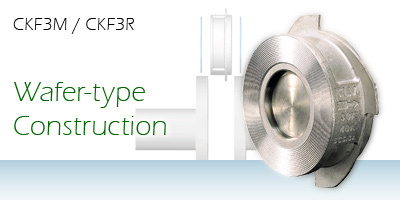 CKF3M/CKF3R: Wafer-construction (flangeless) check valve body is sandwiched between pipe flanges. 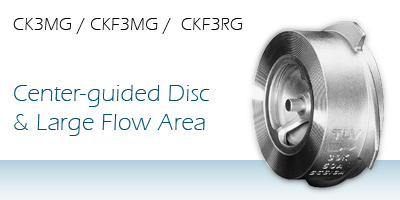 CK3MG/CKF3MG/CKF3RG: Center-guided disc and large flow area ensure superior durability and capacity.